All good things have to come to an end. 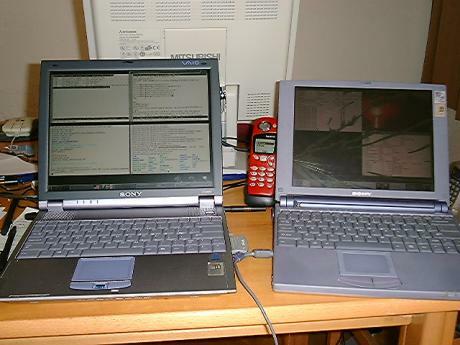 My old Sony VAIO PCG-505TR (on right) had sticky keys on the left side from a soda accident, then the battery refused to charge, and then (while plugged in at a hotel one night) a power surge rendered the monitor mostly useless. So it is being relegated to maintain the inventory of the refrigerator with the aid of a barcode scanner, and it has been replaced by my shiny, new, PCG-R505TL (on left). Before buying the new VAIO, I checked out http://www.linux-laptop.net to find that one brave soul had put Linux on the earlier model PCG-R505TS. His page is at http://www.returntonature.com/linux/laptop but hasn't been responding recently, so the copy cached by the fine folks at google is the one I've been using. Now, before you run off and buy a laptop from Sony and then spend the next week and a half getting it to work, take a look at the web site for Emperor Linux who will ship you a Sony VAIO (many models available) or another name brand laptop, pre-loaded with Linux, and will then support it for a year. Unfortunately I discovered their site a week too late, so I've been putting together the pieces myself. I take my laptop everywhere, as my job requires, and wanted something lightweight. Had a good experience with my old Sony VAIO. Slightly larger monitor than the last Sony VAIO and longer battery life is a good tradeoff for an extra 0.75 pounds (~.4kg). Last laptop held up quite well even under my abuse, and I got a lot of hours out of it before it blew. Cheap. The price was going down about $100 every week and finally stopped at $1400, including the PCMCIA CD-ROM drive. While I could have gotten the power user version for a thousand bucks more, I really don't need anything that zippy to do programming and routine tasks on, and I have a desktop to do my big number crunching. Day 1: Laptop arrives care of girlfriend who was nice enough to import it from the states for me since I'm stuck in Madrid for the summer. Turn it on and it boots right into Windows ME. Need to fix that. Laptop is bright and shiny and has everything you'd want. Two USB ports, a VGA port right on the side, a PCMCIA slot, onboard modem & ethernet, audio, crisp 12" screen, stereo speakers, touchpad and . . wait a minute. Where is the Infrared port? Yes, folks. No IrDA port to be found on the machine. How dare Sony leave that off? I just assumed that every laptop came with IrDA these days. So much for getting on the Internet over the cell phone connected by infrared. Day 2: I sit down to take a whack at RedHat after letting the ISOs for 7.1 download to my desktop overnight. Since I have no floppy drive (costs extra and I used the one on the last computer maybe twice) and I left the PCMCIA CD-ROM drive in the states, it looks like a hard drive install would be the answer. So I copied the ISOs over to my C: partition (since D: was going to be turned into Linux) and copied the dosutils directory over so that I could use loadlin to boot the Linux installer. Ready to go, I pop'd up a DOS prompt and no luck. loadlin needs to be run in pure MS-DOS mode. So I reboot WinME (what's new?) and when it starts to load I press F8 to get that little menu allowing me to go into DOS. Nothing happens. I reboot and try F5. Still nothing. Off to the web, I find that WinME has hidden pure DOS mode. I find a patch for WinME that will allow you to get into pure DOS mode, run an autoexec.bat, etc. Patch installed, I reboot, get into a good 'ol DOS prompt, run loadlin and I'm off. RedHat 7.1 installs without a hitch from the ISOs on my dos partition. The empty D: partition has been turned into Linux, with a 2 gigabyte root (/) partition, a 4 gigabyte home (/home) partition, a ~2.1 gigabyte extra (/extra) partition and two 128-megabyte Linux Swap partitions. The Windows C: partition is accessable as /dos under Linux and was left untouched (for now). Use defaults for everything else. Laptop reboots, I see LiLo, and after five seconds it boots into Linux. Much nicer. Onboard ethernet works. It only powers up when it is plugged into a hub, though. So you might disable the "network" service from starting automatically to avoid the computer hanging while it waits to resolve its name. Pull out one card, put the other one in. USB comes up fine (in the logs), but I don't have any USB devices to try it out with. Floppy Drive is reported to work by returntonature, though I didn't get one. Modem. Doesn't seem to be assigned to a tty. Jog Dial. No drivers to be found. i.Link. Again, I don't have anything to test it with, and the support in the latest development kernel is still buggy. Docking Station. I didn't buy one of those either. They sent me a PCMCIA CD-ROM drive instead. I was thinking about buying the DVD docking station but I already have a DVD player connected to my TV, and the reports are that the DVD doesn't work under Linux, so I think I can hold off for now. Another heartbreaker, my new Sony uses Advanced Configuration and Power Interface (ACPI) instead of the old Advanced Power Management (APM) Interface. APM is supported by Linux, but ACPI is only in bleeding edge, kids don't try this at home, we warned you in advanced, run fsck manually after your computer haults, development kernel only support. Yeah, I tried it out. Compiled a kernel with the ACPI support and after looking through /proc/acpi and finding that it didn't support my battery, my computer locked up. .. which is all the info that I needed. But how to put it to use? So I wrote a PERL script called powerwatch.pl. This nifty program runs the vaiobat program every 15 seconds and does two things. First, it writes the current status to /var/log/vaiobat, since the vaiobat program is really a hack and you can't have two copies probing the PCI bus at the same time. It also monitors the power levels, and if you are running on battery will dim the monitor using setbrightness and will estimate how much time you've got left based upon the current drain rate and the current battery charge. Very useful. It creates a log file at /var/log/powerwatch that you can watch with tail -f /var/log/powerwatch while it is running to see the current status. .. to automatically run the powerwatch service when we are in the appropriate runlevels (2-5). Now I know how much power I have left, and when I am not on AC it will dim the monitor to save juice and estimate my time remainig. But I really don't want to keep a window open with tail running all the tim just to see the power usage. So I went to Freshmeat and found an applet for Gnome's toolbar called Battstat that is available under the GNU Public License (GPL). So I downloaded, made a few modifications, recompiled and installed. Now it reads from my /var/log/vaiobat file that powerwatch creates instead of asking the old APM daemon. This gives me a little applet at the bottom that tells me if I'm on AC or DC, and the current battery charge (%). My hacked version is here. Just untar, run ./configure, then make and make install and you're all set. I still can't do a suspend to disk or memory until the ACPI stuff settles, so I will have to hope that the ACPI4Linux project makes good progress. But in the mean time I can at least see my battery status and my powerwatch will shut down the computer nicely in case I run off and the battery drains to the bottom. Here are some of the useful toys that I've bought for the laptop. Xtend Micro makes the PowerXtender that plugs into the 13.8V DC "cigarette lighter" adapter of a car, or the little jacks in business or first class on airplanes. You need model E612X, or if you have a PowerXtender already, just get the new cable (E037) (Thanks David Poggi for helping me find htis). Both are sold by Teleadapt all over the world. Then you can throw the laptop in the car or take it on those long overseas flights for music or to get a few more hours of work in. D-Link makes PCMCIA wireless ethernet cards, as well as a nifty firewall/router/wireless access point/ 3-port 10/100 switch that sell for about $95 and $280 respectively at buy.com. So with the two I can roam around the office or home wirelessly. The D-Link PCMCIA card (DWL-650) works fine under the latest PCMCIA CardBus software that comes with RedHat 7.1, just pop it in and go. If you set up DHCP on the hub, you'll be online in a few seconds. I've had a FujiFilm MX-2700 camera for a few years now and I bought Fuji's PCMCIA/SmartCard adapter since my camera takes a SmartMedia SmartCard® and not the Sony Memory Stick®. If you have a Sony product that takes the Memory Stick®, you can just use the built-in port (see Journal Day 3 above). .. you can pop in the PCMCIA card, put the smart card into that, and then type mount /mnt/smart (after making the /mnt/smart directory of course). Just make sure to umount /mnt/smart before taking the card out. Then you can copy files on and off the Smart Card at moch speed. Jansport as well as making quality backpacks, used to make a computer sleeve. I can't seem to find it anymore, but the place I bought it from, Eastern Mountain Sports sells a similar computer sleeve for $25 by Eagle Creek, as well as a host of backpacks that have special computer areas. I bought the computer sleeve which olds the VAIO and all my accesssories and then I tuck that into my backpack or carry-on luggage. Much less conspicuous than hauling a laptop bag around, and less likely to get stolen. I purchased a GSM-Only PCMCIA card from Option International. After going back and forth a few times to get the right cable for my Ericsson A1018s cell phone, I had a working solution for wireless Internet in Europe. Pop the card in and it shows up just like a modem. Dial your favorite ISP and log in, then start ppp and you're on the 'net from wherever you can get GSM coverage. They also make a complete PCMCIA solution that doesn't require a phone. Check with your GSM provider before you try that one out, though. This is a replacement for APM (Advanced Power Management) and not completely supported by linux. See Journal Day 3 above. All of the information in this web page is accurate to the best of my knowledge, but by using it you agree to indemnify me (hold me not liable) for anything that happens to your computer. If you don't agree with this, please close your web browser and manually remove this web page from your local cache. ;) With that said, good luck and Godspeed. If you found this page useful, or have a question, you can e-mail me at ryan at catalina dot org. Or send me a post card at PO Box 3672 in the city of Santa Barbara in the beautiful state of California in the United States of America. The ZIP code is 93130.
work as a USB storage. So I also let everything work with Debian Woody. article, which helps a lot while I purchase my laptop in Fry's. After almost half-year, I finally got my laptop have suspend function enabled. 320MB RAM, so I have 512MB SWAP. It's 1.6 times to my physical memory. tell you guys a good path to reach my way. Intersil chip which need latest pcmcia support to have a description on it. configuration file by "make menuconfig"
need to make my machine running with suspend function well. After you got these files, start your engine! Chaptor One - patch all you need to patch! linux-2.4.19.tar.gz -C /usr/src/". You'll got a directory "/usr/src/linux-2.4.19/"
command "cp -rf linux-2.4.19 linux-2.4.19orig"
Then put your patch acpi-20020918-2.4.19.diff.gz in /usr/src/. You'll got "acpi-20020918-2.4.19.diff" in your /usr/src/ directory. patch with it: "patch -p0 < acpi-20020918-2.4.19.diff"
After you uncompress it, patch it! "patch -p0 < patch-acpi-acpi20020918-swsusp15"
www.kernel.org and other patch files again. I suggest you load this config file and then just save and exit. 1f. Compile PCMCIA for yourself. untar it: "tar zxvf pcmcia-cs-3.2.1.tar.gz -C /usr/src/"
remove the files by your hand "rm -rf /etc/pcmcia", "rm /etc/sysconfig/pcmcia"
before recompile and install pcmcia-cs package.